Among College staff, a “significant morale issue on campus, especially among support staff workers” has existed for up to a decade, according to the Williams Staff Committee (WSC). Staff members say that they feel expendable and unvalued at the College, a perception that is exacerbated by a lack of involvement in decision-making and an inability to advocate for themselves. Fear of “retaliation,” staff members said and WSC confirmed, often dissuades staff from voicing their concerns to management. Many staff members expressed hope for change in the near future, however, with the arrival of President Mandel and the beginning of the strategic planning process. Staff members will hold seats on the strategic planning coordinating committee and on each of the eight working groups to assist in determining priorities and initiatives for the College to adopt in the coming decades. Five staff members across Dining and Facilities and one former employee spoke to the Record about management’s disregard for worker concerns, general feelings of alienation and their experiences of what they felt to be racist, sexist and homophobic treatment. These employees spoke on the condition of anonymity due to fear of retaliation and of losing their jobs. They requested that stories of their individual treatment not be published because they feared they would be identified and face retribution for speaking publicly. Comments from WSC suggest that other staff have expressed similar concerns to WSC but that they have been afraid to voice their opinions to managers. Four custodians who spoke extensively to the Record are identified in this article as A.Z., B.Y., C.X. and D.W. The initials have no correlation to their names. The FSI Report demonstrates that these issues have persisted for some time, according to Andrew Cornell, visiting assistant professor of American studies. “All of these voices are saying 10 years later: That hasn’t changed, and they’re feeling the same thing,” Cornell said. Staff members hold differing opinions as to how long the morale problem has existed. Many pointed to the 2007–08 financial crisis as the precursor to several changes – including a decrease in departmental budgets, a hiring freeze and the discontinuation of some informal benefits, such as free massages and an annual Christmas party for staff – that suggested to them that the College viewed support staff as the institution’s “bottom feeders.” Others identified a “good old boys’ club” in management that consistently did not cater to the needs of staff. The 2009 FSI report detailed “a culture in which staff do not feel comfortable reporting concerns because they fear it will lead to some sort of retribution, such as less appealing assignments or hours, or even termination.” Some staff members told the Record that they are still reluctant to voice concerns because they believe they would anger supervisors. They say that supervisors have punished them in the past with additional and unappealing assignments. “If you have an opinion, or a brain cell, they’re not interested,” B.Y. said. Apart from speaking directly to supervisors, staff can contact Human Resources (HR) to report incidents. Some staff say that they had little success communicating with HR, however. A former Facilities worker who left for a better-paying job said that management’s and HR’s unresponsiveness to employees made his department an unpleasant place to work. Cornell, who studies labor and unions, said that the lack of a union deprives College workers of a formal mechanism to raise concerns and to hold managers accountable, making them more susceptible to mistreatment by management. There is not believed to be any current attempt to unionize College staff. In late 2017, custodial managment implemented a “rotation system” to switch custodians between different buildings each month. Both custodians and faculty members said that they disliked the system because it undermined relationships and communities formed between those who worked in the same buildings. Some custodial teams were told by their supervisor to sort cleaning supplies by colored tape, a directive that many found demeaning. A January 2018 meeting addressed “customer service.” A.Z. said she felt as if she were being “brainwashed,” and B.Y. interpreted the meeting as a threat. “It was basically, ‘Put a smile on your face. There are cleaning companies knocking on their door every day [interested in custodians’ jobs], and none of us want that to happen,’” B.Y. said. Faculty members in Hollander Hall raised concerns about the rotation system at a Committee on Priorities and Resources (CPR) forum in early 2018, and the program was discontinued that spring. “We became involved because we cared about our colleagues, and how our colleagues were being treated, how our colleagues were not being involved in the thinking about their daily professional lives,” said Professor of Russian Janneke van de Stadt, whose office is in Hollander. van de Stadt also expressed concern that custodians felt unable to effect change by articulating their own discontents. Custodians said that they were not consulted before the rotation system was put into place, although Executive Director for Facilities Operations Bob Wright said that the program was meant to address interests expressed by custodians. “Our opinions don’t amount to a hill of beans around here most of the time,” C.X. said. Director of Human Resources Danielle Gonzalez described HR’s commitment to providing confidential response to concerns but did not comment on response time. The difficulty of proving mistreatment can lead to the dismissal of valid claims, according to custodians. Wright said that retaliation has never been raised to him as a concern and that he instituted a monthly forum last year to allow Facilities staff to have their concerns addressed. Some custodians cited the 2007–08 recession as the time of a cultural shift. Custodians hold a perception that the College tends to hire externally rather than hire internally for jobs and that education and experience are commonly cited as reasons for rejection. They said that this tendency has prevented custodians from leaving unappealing environments and from being hired into other positions they applied for. Many believe that favoritism impacts their experience in the workplace and that more vocal employees are often disliked. “They change the rules by what they want – it depends on who the person is,” A.Z. said. After their yearly training meeting last Wednesday, custodians said that they saw management putting in more effort than before, but while some expressed hope for change, others remained doubtful. “I’m skeptical about things, too, but all you can do is sit here and be hopeful and ride out the storm,” C.X. said. B.Y. said that she believes the problem lies within individuals in management rather than the College as a whole. Established in 2012 to provide better representation of staff interests in decision-making processes, WSC is an elected body that “seeks to increase the visibility of staff on campus and to advance their role in the life of the College,” as written on its website. The committee works to bring ideas from staff to senior administrators and improve communication within the staff community, among other functions. Although WSC seeks to serve as “a group that the senior administration may consult for staff input on college issues,” it does not formally hold decision-making power. Trevor Murphy, an instructional technology specialist in the Office for Information Technology, served on the 2012 ad hoc committee that led the planning process for what eventually became WSC. Murphy said that the effort grew out of his and other staff members’ experience on the Committee on Diversity and Community (CDC), which he joined around 2008. “If a committee wanted a staff member to join they could go to the staff committee and get names,” Murphy said. “Similarly, if a committee wanted to know what staff thought of an idea or proposal, they could take it to this new staff committee. Staff inclusion and representation have been at the center of the committee’s pursuits, said Assistant Registrar Amanda Turner, who served on the committee from 2014–2016. WSC collaborated with the Diversity Action Research Team (DART) in both 2014 and 2017 on surveys sent to all staff, with responses recorded anonymously. 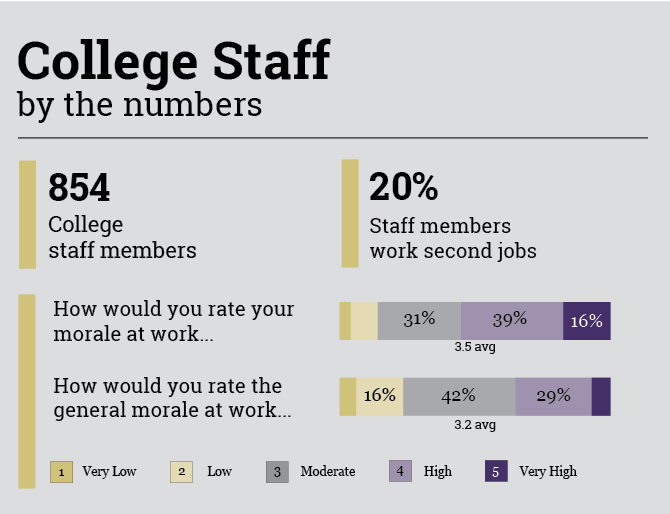 Staff ratings for morale were concerning in both surveys, WSC said. In 2017, “your morale at work” averaged a rating of 3.5, on a scale of 1 to 5, over 625 responses, and “the general morale at work” was rated an average of 3.2 by 627 staff members. Averages in the 2014 survey were 3.6 and 3.1, respectively, for the same prompts. Staff lacked the power/courage to stand behind the proposal as faculty did. As a staff member I was willing to let things drop if I was told, ‘No,’ because I valued my job over process and governance. Some of the other staff members I worked with felt the same way… Every time the proposal was in jeopardy of failing, a faculty member would pick it up and strengthen the proposal and boldly present it. Without faculty support I am certain we would have folded our efforts… I found those advocates, and they helped make it a reality. In a Claiming Williams panel titled “A Seat at the Table: How do Staff Claim Williams?” on Jan. 31, WSC presented and discussed data from the 2017 survey. The responses the committee presented as encouraging – “the work I do is valuable to the institution,” “the College is responsive when personal or family needs arise,” “I am satisfied overall with Williams as a place to work” and “I am satisfied with my employee benefits” – ranged from 4.0 to 4.4 in their average ratings. Among the lower ratings, “there is a safe way for me to bring up problems at work” was rated an average of 3.6, “I have adequate opportunities for training to improve my skills” was 3.5, “the College clearly communicates its procedures and policies” was 3.5 and “I am paid fairly for the work I do” was 3.3. The lowest average ratings recorded were for “I have adequate opportunities for professional advancement” at 3.1, and “the evaluation process helps me improve my job performance” at 2.9. Previous budgets had specific allocations for professional development, according to WSC. While current budgets may not be smaller in size, they lack specifically designated professional development funds, leaving allocation up to individual supervisors or directors. “Internal professional advancement at Williams has become fairly stagnant since staff aren’t always given the resources to better themselves as it relates to their job responsibilities,” the committee said. Ratings for fair treatment based on sexual orientation, religion, race/ethnicity, physical ability, gender and age ranged between 3.7–3.9, an outcome that the committee found encouraging. WSC nevertheless confirmed that the survey contains narrative accounts of perceived unequal treatment on the basis of race, gender, sexual orientation, class and physical ability. Some staff, however, said they did not fill out the survey because they feared that they would be identified by their responses. Laini Sporbert, a health educator, said that she had heard concerns expressed about anonymity, although detailed information was not shared. “No supervisor or senior staff got the detailed information, but I understand that there is still that fear about saying anything to anyone, whether it be anonymous or not,” she said. Some question that the results accurately reflected perceptions held across all departments, speculating that the staff who work in office settings were more likely to offer responses. Vice President of Institutional Diversity and Equity Leticia Haynes said that due to the anonymous nature of the survey, data from the survey could not be broken down by department. WSC members have praised the committee for uniting staff who share concerns and serving as an avenue for discussing important issues. Sporbert called the staff committee “empowering” and, while acknowledging its limitations, expressed hope that it could lead to greater power for advocacy. The strategic planning process was often cited as a source of hope in WSC’s Claiming Williams Day panel. Mandel began the planning effort in her first few months on campus, describing it as “a way to define priorities and focus investments” and “a chance for us all to work together toward a shared future” during an Oct. 29 student forum. Two staff members – Dawn Jamros, a departmental administrative assistant in biology, and Dave Bartels, a security patrol supervisor for Campus Safety & Security – serve on a 14-person coordinating committee chaired by Mandel. Eight working groups, to be finalized this month, will each include staff members. The committee has held staff forums at the beginning of the process and will continue to provide opportunities for communication, according to Mandel. An online comment form is also open for all to submit suggestions or criticisms. A meeting last week with Provost David Love about the strategic planning process also inspired confidence in some custodians. Love said that he solicited feedback from custodians regarding how they would like to be involved in the strategic planning process, including anonymous submissions. President Mandel has assumed leadership at an institution deeply rooted in tradition and one who appears to respond glacially to change. Sentiments toward staff certainly won’t change overnight, but it appears that the idea of encouraging greater staff involvement in campus decision-making processes is slowly gaining momentum. Turner, a panelist, expressed “renewed hope” during WSC’s Claiming Williams Day event. “I think staff are cautiously optimistic about the change in leadership,” WSC representatives said. “President Mandel has certainly made an effort to connect with the staff committee and ask for our assistance in gathering staff interest/nominations for staff representation on committees for the strategic planning process and the Committee on Free Expression and Inclusivity. Editor’s note: This article was updated at 3:55 p.m. on April 11 to correct the statistic for “general morale” in the graphic.